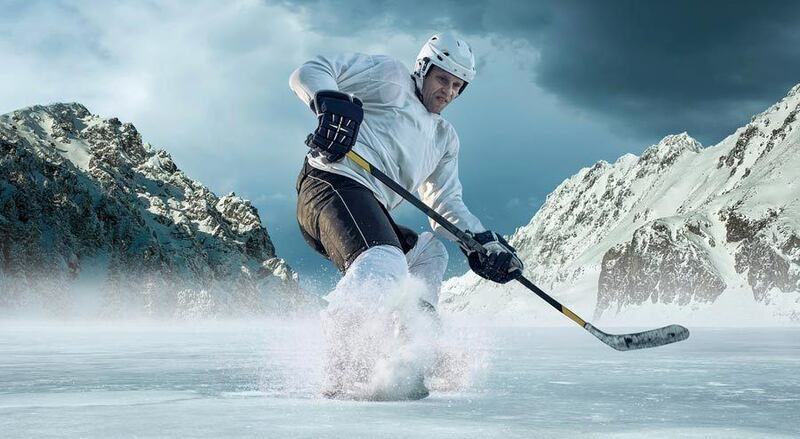 Bauer is a giant when it comes to ice hockey equipment and most experienced players have owned at least one Bauer brand item in the course of their play. The company designs quality equipment and affordable prices and most players are happy with the value and durability of their skates. They are also proud to have a team of people behind the company who understand hockey equipment and have a passion for the game. They can help you choose the best piece of equipment to suit your needs, even if you’re new to the game and you’ve never purchased skates or any other equipment in the past. They take pride in providing the best customer service experience possible for customers, and they want to do everything they can to make sure you get a product that’s going to enhance your love of the game. Everything in Bauer’s extensive line of equipment is designed to meet the safety standards of youth league hockey leagues. There are third-party companies that sell Bauer equipment located all throughout the United States. It’s also possible to shop for Bauer equipment from online third-party retailers. The company offers a wide range of skates and one of our favorite models is the Bauer Supreme S150 Senior Ice Hockey Skates. 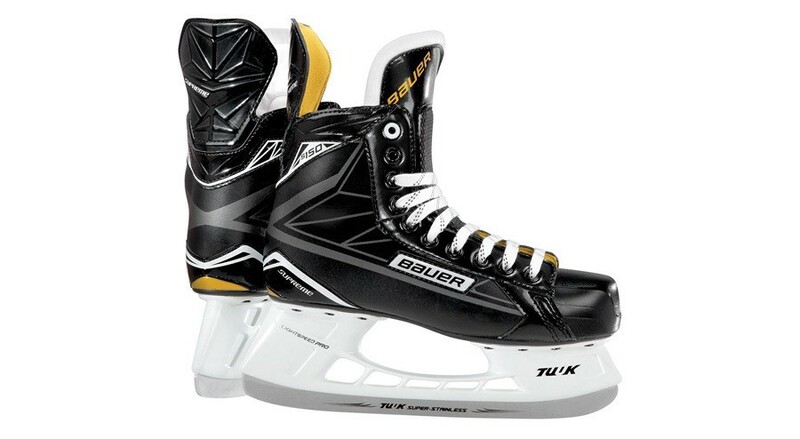 These adult and youth hockey skates are part of Bauer’s Supreme line and are designed with special features like ankle padding, a metatarsal guard, and other leading innovations to ensure a quality fit and can withstand explosive power. More advanced ice hockey players will love these skates, but new and intermediate players find them to work well too though all require a little break-in time, irrespective of the shoe size. They are reasonably priced and feature a sleek, stylish design in black with white and mustard colored highlights. The Bauer Supreme S150 Senior skates are comfortable and durable on the foot, including the heel and ankle. As mentioned, they require some break-in time—as most skates do—and might need to be sharpened before use. We like these skates because they are lightweight and a great value for someone looking for quality skates without spending hundreds of dollars. They are part of Bauer’s Supreme line but do not feature the quick release system for the stainless steel blades. Buyers like the S150 senior skates because they are designed based on the needs of expert skaters, but come at a price that novice and intermediate skaters can afford. They are durable, comfortable, and stylish. Most skaters are happy to report that these skates feature rugged construction with a design that protects the feet from movement and impact. The rugged plastic used to make these skates has a downside—they require some time to break in—but it’s worth it because they offer protection for your feet when playing ice hockey. Most buyers have to sharpen these skates before using them and a few recommend investing in blade protectors to extend the life of the skates. Despite having to break them in before wear, the S150s feature a soft inner lining that makes them comfortable to wear for several hours at a time. They fit snuggly, which prevents blisters, and are lightweight, which is something that can be a challenge to find in quality, comfortable skates. Buyers of these skates love the fact that they are both functional and stylish. They have sleek lines and suit just about any style. Most every buyer who purchased and used these skates would recommend them based on all of the important factors in ice skate buying: price, durability, fit, and comfort. Buyers would also buy the S150s for themselves again when their current pair wears out. These skates are durable and comfortable, but require a bit of breaking in. They feature a heavy-duty plastic coating that protects the feet but also needs to be bent and shaped a bit before skating. It’s a good idea to size down a size to a size and a half in these skates, which is common when buying ice skates. You want a snug fit to prevent blisters, and the senior S150s are pretty standard when it comes to size. These skates check all the boxes when it comes to ice hockey skate buying: they are durable and will last through multiple seasons of play; they are comfortable and even though they need to be broken in, it’s possible to wear these skates soon after you get them without blisters or aching feet; and they are affordable and cost less than $$—a steal when it comes to quality skates. You can buy the Bauer Supreme S150 skates on Amazon, which means you’ll rest easy buying from a reputable online retailer. Most of the time, the best bargains will be available online and you have plenty of size options, so you won’t be wasting time looking all over for what you need. Prices are often better at online retailers and depending on where you shop, you might not even need to pay extra for shipping. If there’s a nearby retailer that sells S150s, it’s a good idea to drop by and try on the skates before buying. This way you’ll know exactly what you’re getting before making your online purchase. We recommend this tip to anyone in the market for new skates because it cuts down on so much of the risk of buying online. You get the deal without worrying about having to exchange because of size issues. Remember, if you need any accessories to go with your skates, like blade protectors, you can find them online at Amazon or any other online retailer that sells Bauer. This is also true for other equipment in addition to your skates. The Bauer Supreme Senior S150s senior ice hockey skates are some of the best skates you can find in their price range. They are durable and comfortable—the two main factors most players consider when shopping for skates. We’d recommend these skates to new players, as well as intermediate and advanced skaters.